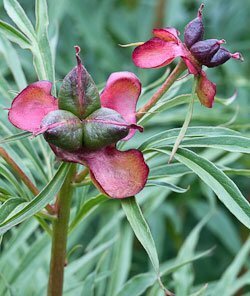 You may wonder about growing peonies from seeds. This can be tempting to try when you notice the pods that some types develop after flowering. Popular cultivars don’t come true from seed. Many peonies – generally, the big double ones – are infertile (they don’t produce pollen or seeds). Patience is required. From seed it can take five to seven years to produce a mature flower. Sometimes novice gardeners mistake the seed pods for seeds (or even bulbs), and wonder if they can cut the pods off and stick them into the ground. But starting these perennials from seed is a lot more involved than that. When you find seed pods, leave them on the plants to ripen. 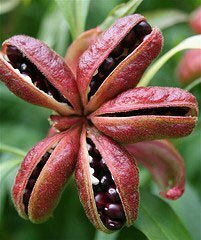 Wait until they harden and begin to open, and you’ll see the seeds. This is the time to collect them. To germinate, the seeds need a period of moist warmth for a few weeks or months, and once a root has emerged, they need a period of cold for about 10 to 12 weeks. Quebec peony grower, Lindsay D’Aoust, provides detailed instructions for growing these plants from seeds (link opens in a new browser window). Of course, if you’re not interested in collecting seeds, simply deadhead the plant after blooming, so it will put its energy into the roots, and not into seed production.